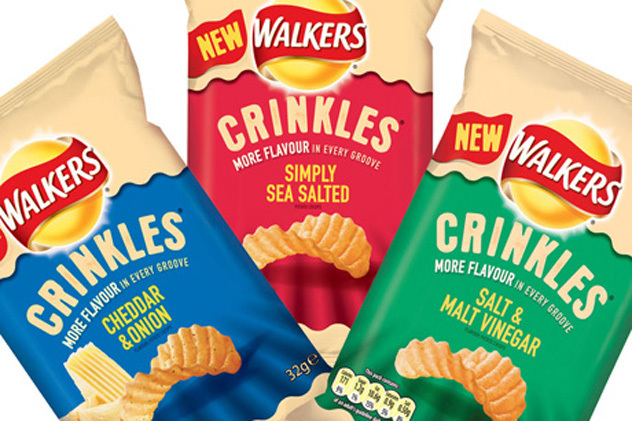 Walkers have just launched “Crinkles” – a fantastic new range of crinkle-cut crisps. 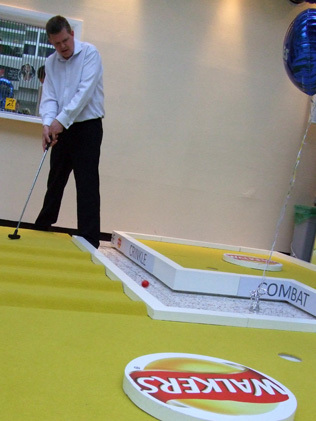 As part of their marketing campaign, we at UrbanCrazy were asked to build and supply a branded, crinkly-surfaced crazy golf course for an event at the ASDA headquarters in Leeds earlier this month, where staff could sample the new snack and play the putting course in an attempt to win a prize. 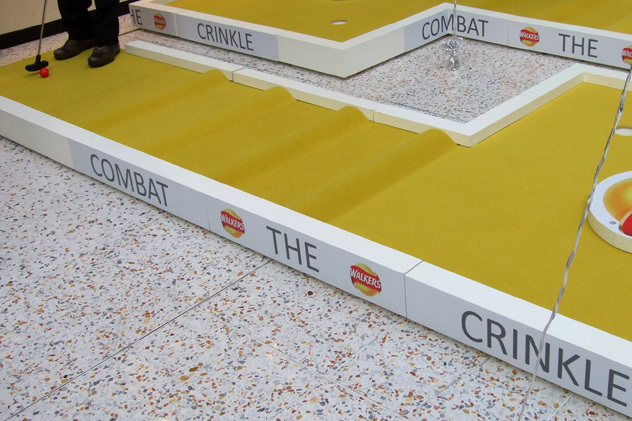 The course included a potato crisp-coloured surface with a series of humps resembling crinkles, strategically-placed obstacles adorned with the Walkers logo and the campaign’s tagline “COMBAT THE CRINKLE” printed all along the borders. 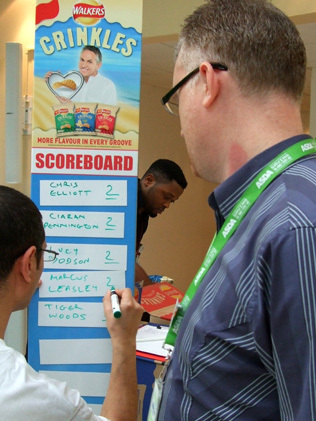 The banners and scoreboard surrounding the course featured the face of Walkers – Gary Lineker – who is himself an ardent golfer. 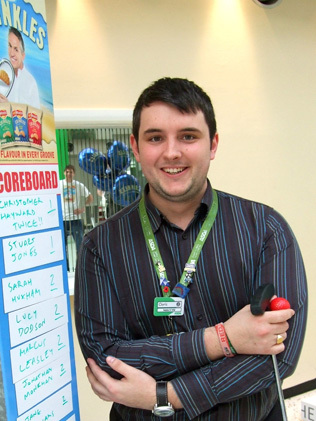 Participants were asked to make a small donation to charities supported by ASDA before playing. They then teed off on either of the identical holes, negotiating the crazy crinkles to sink the ball in as few shots as possible. Those tied on the lowest score would be entered into the draw to win a fantastic Red Letter Day. 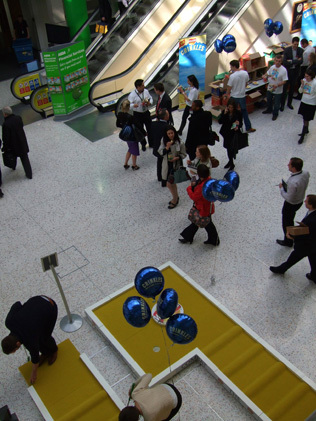 Several hundred rounds were enjoyed on the day, with some players returning a number of times to try and better their score. If only Rory McIlroy were afforded similarly relaxed rules during the recent Augusta Masters he would be lounging around right now in a comfy green jacket! To our surprise, as many as three players achieved a “Hole In One”, which included a delighted Christopher Hayward who managed it twice. 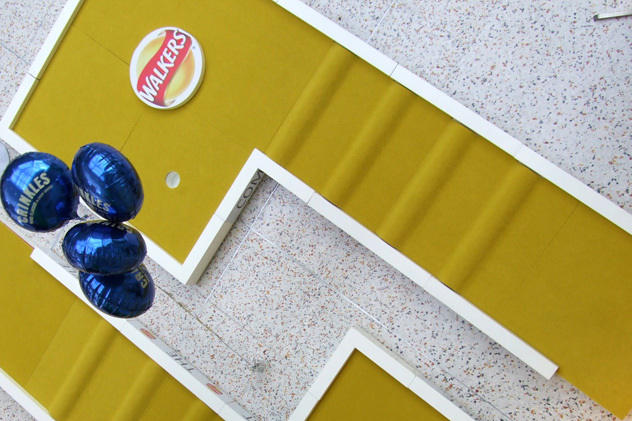 He’d have been even more chuffed had he not lost out in the draw for the prize! 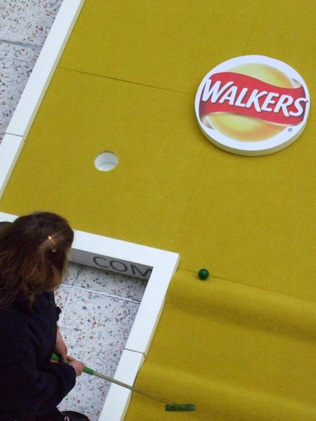 All in all the crazy golf and free Walkers crisps went down well with ASDA’s employees, some asking our stewards when we’d next be back with the crazy golf. 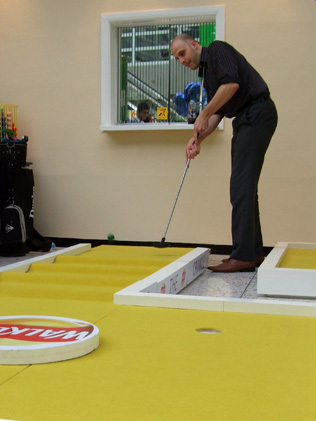 Urban Crazy’s branded and customised mini-golf courses are a fun way of introducing people to your product or service – perfect for your next marketing event. 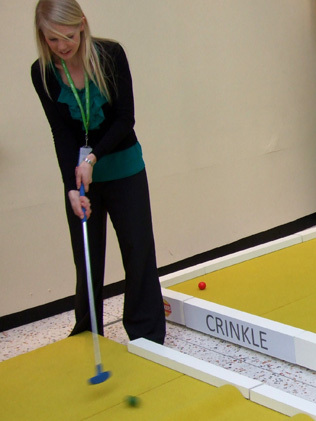 After all, who doesn’t love a game of crazy golf? 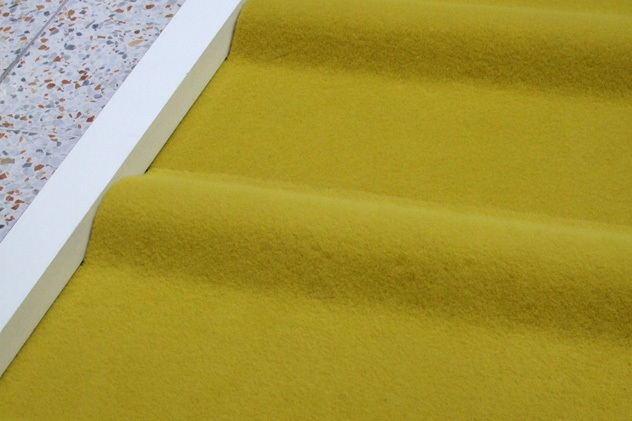 !For more advice and ideas please contact us.